Until one day, my collar was a little dirtier, my bed was getting old, and I didnt get anymore stuffies. I guess I was just not that cute little puppy anymore! I loved them my whole life - What did I do that was so bad they would bring me to a cold, heartless shelter to die - sad and alone? 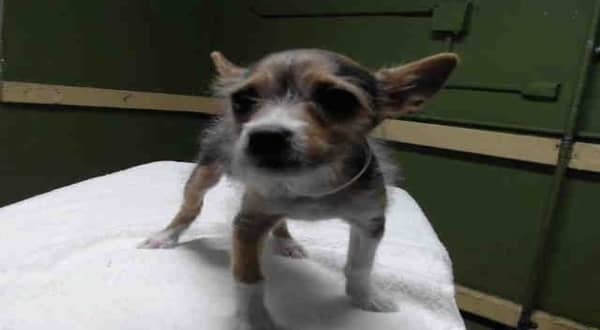 #A5148381 I'm an approximately 3 month old female Chihuahua. I am not yet spayed. I have been at the Carson Animal Care Center since 2/4. I will be available on 2/8. You can visit me at my temporary home at C404. And yes, this puppy needs a miracle. Share this little dog’s plight with friends, family, social media contacts and approved rescue organizations. Sharing saves lives. 2 Responses to "3 Month Old Chihuahua begging to be saved from deadly shelter"
Any update on the 3mo old Chi?